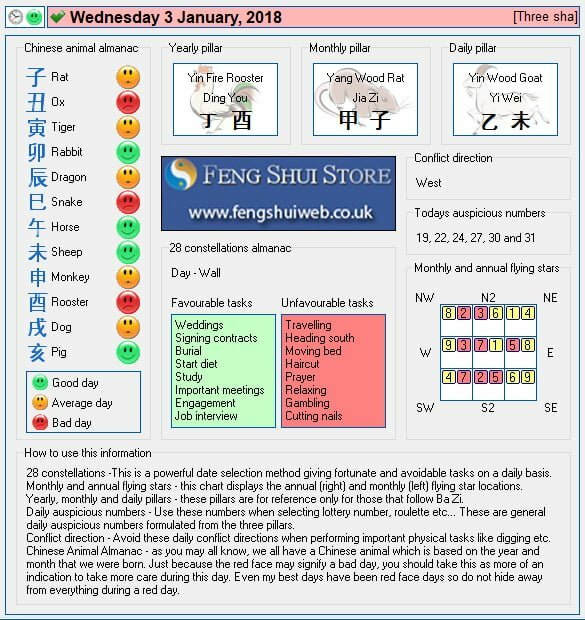 Here is the Free Feng Shui Tong Shu Almanac for Wednesday 3rd January 2018. This new webpage is very confusing, and not very user friendly. I’m no longer able to view each monthly almanac page for the year, like I use to be able too. I wanted to look at July 2018, and there is no where I can find it. There is no rhyme or reason for the new layout, it’s just a bunch of information with no logical format so that you can find exactly what you are looking for. Also, the loading time to get into the site, is very lengthy. I never had a problem in the past getting into your site, but now it takes a long time to upload. The information I use to access is no longer there. This format not only looks unorganized, it also looks “junky”. You could benefit from getting a professional web master to set up a more user friendly page, that looks professional, and intuitive. I spend way too much time, looking through all the ongoing posts, trying to find what I need. It should have a logical order and tabs that can be clicked on to access the exact information I am looking forward, instead I have to scroll through lots of junk looking for what I need. I don’t mean for this to sound critical, its meant more to be constructive feedback in hopes that you can change the entire layout of your site to be more user friendly. Honestly, I’ve stopped using it over the years because its so difficult to find what I need. Other website have a logical order to the their information, such as tabs down the left, or right hand site that once you click them you can go into exactly what you need. It makes it so much easier. I’ve always enjoyed your company, but your website has always been lacking. Hope you can really make some changes to it in 2018. I tried to send this message in the message center below but the send tab is not working. Also, a few of the pages I’ve gone into come back with error messages. Very frustrating. If the website is showing as a lot of text, our web designers are working to fix this at the moment. For some reason, it is only doing this in certain locations. This should hopefully be fixed shortly. It doesn’t come across as critical, Sherrie and I always welcome peoples opinions on what they like to see on the website. Thank you for letting me know and I’ll take a look through the site and see what can be improved. If you have any suggestions, please feel free to let me know what you’d like to see on here, Sherrie.